ALG Defense 6 Second Mount: Worth the Cost? It’s costs half of the host gun. It adds weight, bulk, and there are almost no available holsters for it. Why is the 6 second mount worthwhile? That’s a question I will have to answer as I go along. The mount and red dot is a difficult beast to tame. I can just tell from handling this setup at home that I will need to be very precise with my grip and presentation of this pistol from the draw or I won’t have that dot anywhere in the window. Any bit of twist or improper grip and the dot is lost. I have to grip the weapon perfectly to find that dot dead center in the glass, and that’s been my goal with the first few days hands on: develop muscle memory to aid in fast sight acquisition. Forget this mount if you haven’t mastered your draw and presentation of the pistol, for the mount and red dot will slow you down significantly if you are a novice to the pistol. The mount is attached through the trigger pin and slides into the polymer rail. Purple loc-tite (not included) keeps all the screws together to inhibit backing out. The 6 second mount is front heavy, and when a TLR-1 or similar tactical light is added, there is a huge weight shift forward of the trigger guard. I am wondering how much this weight shift at the muzzle will dampen muzzle flip, because it will no doubt affect how flat this gun shoots as equipped. Also of note, you see every little… tiny… bit of movement on trigger squeeze with the red dot. It was cheaper for me to order the mount from Texas than it was to walk down the street to ALG defense and buy it in cash. Tax laws. Awesome. The rear sight must be removed to allow easy disassembly unless you want to remove the entire mount each time you clean the pistol. I removed the rear sight. The front sight may stay in place, but a key-note is that the front sight must be on the shorter side instead of the longer front sight assembly’s such as the fiber optic equipped front sights… the length of these sights will cause them to impact the 6 second mount during recoil. I believe it would literally shear the sight right off the slide. I kept the small plastic nub of a front sight that came with the G17 in place. Once it is removed, it permits some work and cleaning of the G17, particularly the rear of the pistol. 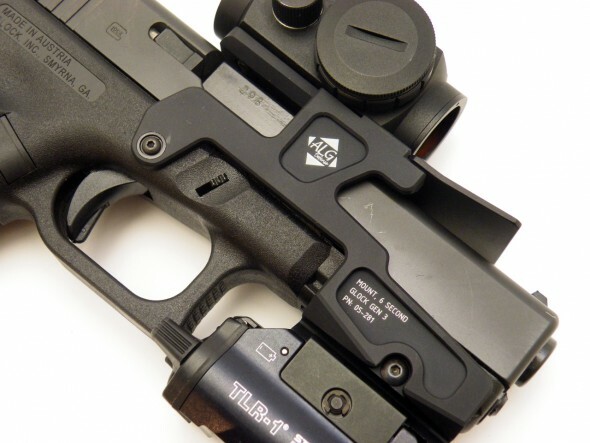 It does not permit trigger removal, or slide stop removal without removing the ALG mount from the G17 frame. Overall my first thoughts are… why did I buy this? Oh yea… because I want a practical pistol that I can use both in USPSA open division and keep around the house as a reliable pistol for self-defense. Once my custom holster has been made, I can conceal this setup in under a coat or jacket and have as close to a PDW in a portable package as I can get. But it’s going to be oh so much fun to master this setup. Simulated Sight Picture:I have not been to the range yet with this setup. Stay tuned to looserounds.com and here on TNR for my USPSA pistol series featuring video of the ALG Defense 6 Second Mount. Still hoping to see a review. Saw you added a trigger, but have you shot it yet?